Micromax canvas tab p666 is the latest generation tab which has been launched recently. This tablet has Intel processor inside and it is the first tablet by Micromax of all the tablet which are going to release in 2015. Other amazing part is that it has 8 inch display which comes with 1280 X 800 display resolution, so it will give you a decent viewing angle. 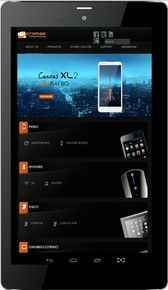 Micromax canvas tab p666 runs on Android 4.4 Kitkat which is among the latest version so it will run fast with 1.2 GHz Intel Atom Z2520 dual core processor and 1 GB of RAM and 8 GB of ROM. It comes with expendable storage so you can insert a micro SD Card of up to 32 GB capacity. You can use micromax canvas p666 Tablet as a phone as well, as it comes with calling facility. At the end, Micromax canvas tab p666 has a good design and comes with 3G and calling. You can connect with your family and friends with Wi Fi service, voice calling, Bluetooth 4.0 version, and GPS. It is best for gaming, for watching movies, to check mails, for web browsing, for your day to day tasks with a smart device in a last screen format. So if you are looking for a tablet with all the features in decent price range then you can buy Micromax canvas tab p666 online by comparing it with other shopping websites such as Flipkart, Amazon, Snapdeal Etc. I am writing this review after using the product for 2 weeks. Although the price is very attractive ie just below 11K, I won't recommend you to purchase this tablet, and rest is upto you! 4. External memry storage which is expandable upto 32 GB. 5. Android 4.4 kitkat OS. 1. RAM is the big issue of this tablet. You will get only 120-250 MB of RAM for free out of available 1 GB. After booting your device available RAM is 280-370 MB only. So be careful before purchasing this tablet if you need to much of RAM free for heavy gaming and other applications. 2. Wi-Fi signal strength is too poor. Eventually you will get connected to a wi-fi but signal strngth will be poor even though the available signal strength is strong. 3. Freebie available with the product are : headphones, OTG cable, charger, Screen guard and warranty card (as mentioned on the box), but when I ordered this product(from different website), I didn't received head phones and Screen guard. When I contacted the customer care service of that website for replacement, they said, as it is not mentioned in thier technical specification webpage of thier website, they won't provide any replacement! 4. Internal storage available is 3.99 GB out of 8 GB and you cannot move apps from internal storage to external storage! 5. Charger pin and OTG pin are difficult to make connection with tablet, they are really tight or uneasy kind of thing. 6. Back button sometimes don't work properly!